Of course, even if football doesn’t do it for ya (wow – I said that out loud!) there are the commercials which are always amazing! My fave every year is the Budweiser Clydesdales. And there’s the halftime show that’s always out of bounds. And I’m not just about the Patriots, the Los Angeles Rams are playing, too. But since I’m a fan of anything Mexican and/or Southwestern, I’ve already got plenty of inspired food that you might find in the LA area on my post of Mexican Food For Cinco de Mayo or Anytime. Here’s the official NFL website if you want to check out the happenings. And just try not to spend the afternoon checking out the Clydesdales on youtube! But enough goofing around, let’s talk food! Last year, I did a post (Minneapolis hosted that Superbowl) on Philly Cheesesteak Sliders since the competition was between the Philadelphia Eagles and the New England Patriots. This year, I decided to carry that theme forward and all I could think about making were these Boston Sausage Pepper Grinders. Admittedly, there were some wings I made earlier in the week, but even though they looked beautiful, still needed some tinkering so they won’t be out on my site b/4 the Superbowl. I keep saying I’m all about easy this year, and there isn’t anything easier than fryin’ up a big ol’ mess of peppers and onions to serve with Italian sausage on a steamy, soft roll. I was inspired by The Sausage Guy, who got his start at Gillette Stadium, almost 30 years ago. And as far as I can tell, he’s tossing out these Boston Sausage Pepper Grinders old school. Just mild (or hot) Italian sausage links (although he makes his own sausage, and you can buy it!) peppers and onions. I love that – just letting the flavors shine for what they are! And they’re served with all the usual suspects, except there are Boston Baked Beans as a side, and I have just the recipe! Cheers Boston Baked Beans, Instant Pot or Not. And if these recipes don’t satisfy your New England dreams, check out my creamy, dreamy New England Clam Chowder. Ya gotta love, too, that Boston Sausage Pepper Grinders is one of those recipes that you can make for game day with the fam or make in larger quantities for a party. Just multiply things out and transfer them to a slow cooker to keep warm for serving or toting to a party. 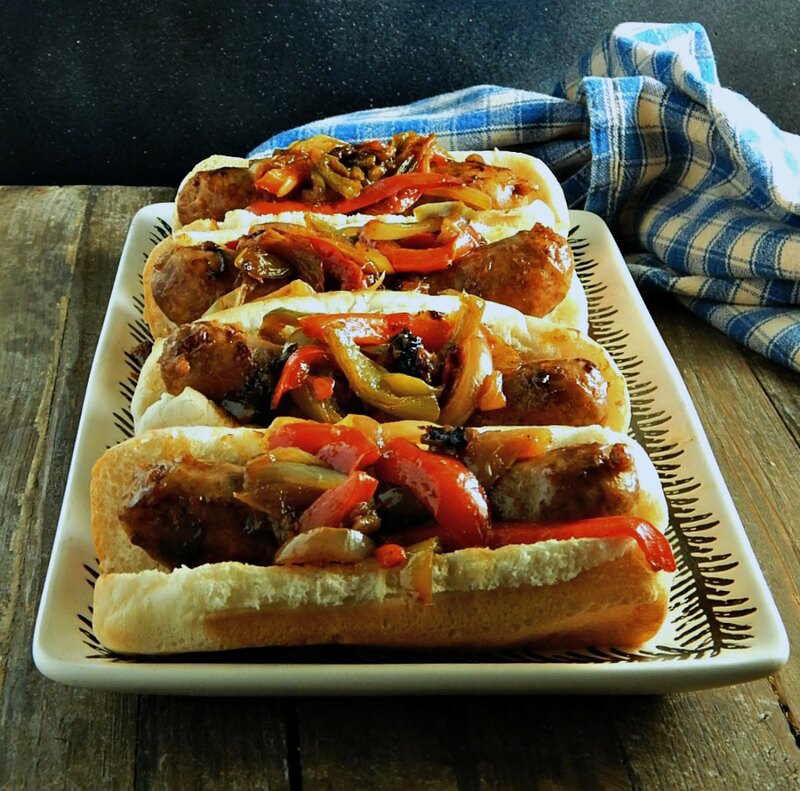 Nestling those sausages into the peppers and onions won’t hurt either – au contraire! Those peppers and onions will pick up even more goodness from the mingling. You’re going to want to use a large skillet to cook your peppers, onions, and sausage for Boston Sausage Pepper Grinders. What you’re looking for is juicy, tender onions and peppers with just a little char around the edges. They’re going to melt in your mouth and settle over those snappy Italian sausage links with a sigh. Don’t skimp on the salt and pepper, though. That’s what takes them from meh to sparking with flavor. I added just a touch of garlic powder, too, instead of fresh garlic, which could burn during the cooking. The sausages can go right in the same pan; just give the veggies a good head start. Of course, if you are cooking for a crowd you’ll probably want to do all the sausages in one pan and the peppers and onions in another. I don’t know if The Sausage Guy starts from raw or partially cooked sausage, but if you’re making this you’re not going to want to stand forever over the stove. My method, though a little untraditional, cooks both the sausage and veggies beautifully with only occasional checking. If your pan gets very built up with fond or dark on the bottom, when you’re finished add water and bring to a boil. Scrape with your spatula and the mess should lift off beautifully. If there is ever a time to pick up Italian sausage on sale, the Superbowl is it! There will be sporadic sales later, especially in the summer but some things are just dirt cheap before the Superbowl and any kind of sausage, brats, etc. are going to be at a low. The Superbowl will bring about all kinds of party food at a low at prices you won’t see for months; see my Superbowl Savings for items to watch for. In our neck of the woods, Italian sausage usually comes five to a package; it’s an odd amount. Heck, it’s weird enough that hot dogs aren’t in the same amount as hot dog buns, but the sausage thing? Even stranger. With the leftover buns, I usually make Breadcrumbs or make my Parmesan Toast, which is great on any bread and strangely enough, we like it best on hot dog or hamburger buns. They’re so soft in contrast to the nutty Parmesan topping. Bell peppers can be pretty pricey. Luckily they’re often on sale around the Superbowl, although they still aren’t cheap, so shop around. The green bells are usually less than the red, orange or yellow. Since the peppers are still less expensive than the sausage, a way to really maximize the Boston Sausage Pepper Grinders is to make more sausage and onions, cut the sausages up into slices and toss a bit on the buns, rather than serving one sausage per person. I’ll have a great recipe for leftovers later in the week, too. Add oil to a large saucepan and heat over medium-high heat. Saute the onions and peppers for a couple of minutes until they are barely softening on the edges. Add in a couple of tablespoons of water and put on a lid. Cook for several minutes, checking now and then and turning, adding a touch more water if needed to prevent burning. Once they’re softening and just starting to color, sprinkle them with the garlic powder, then push them to the edges of the pan. Add two tablespoons water and place the sausages in the center of the pan. Lid and let them steam for a couple of minutes until the bottom of the sausages has browned. Remove the lid, scrape up any fond (dark bits on the bottom of the pan) turn the sausages over and continue to cook for several minutes with the lid off, tossing the vegetables as needed until the sausage is done all the way through. Add just a touch more water if the pan is in danger of burning. (A little trick is to rub the sausages across the bottom of the pan to pick up just a bit more color.). When sausages are finished, remove from pan, turn up the heat and cook until peppers and onions are nearly dry and a bit darkened in places. Taste peppers and adjust seasonings on the peppers and onions. Serve on buns, sausage first or peppers first, your preference. I’ll be sharing Boston Sausage Pepper Grinders at Fiesta Friday #261 co-hosted this week by Antonia @ Zoale.com and Julianna @ Foodie on Board. Stop by and visit Fiesta Friday and see what wonderful recipes have been posted this week. This entry was posted in Click here for Fabulous Food Posts and tagged Bell Peppers, Boston, complete skillet meal, Italian sausage, New England, Pork, Sandwiches, Sausage. Bookmark the permalink. Lol, Jhuls! And I’m trying to live down that wise sage, haha!! I fell asleep during the Superbowl, lol….too old!! Well, some weeks almost everything I make turns out good, and others it’s dismal…And of course, I get too excited and post them when I should hold back for those bad weeks, but I have no restraint!! I’m recovering slowly from a number of injuries, so I’m focusing on simple food, easy to do and so glad to be getting back in the kitchen! Boston Creme Pie is a fave of mine!! I like how you think on the New England-ism! Spread the joy…. You made me laugh, Ron!! Cheers! I bet!!! It’s looks amazing. 🙂 you won’t go wrong with these!